We manufacture wide range of Helical Springs matching the industrial demands. Our Small Helical Springs are useful for extensive industrial applications. We supply all types of Helical Springs at very competitive prices. 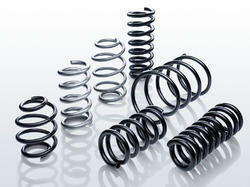 Our company offer a comprehensive range of Helical Springs. These are mechanical devices used to store energy and subsequently release it. These can be availed from us in cylindrical, conical and barrel shapes with ends left plain and ground. Manufactured using premium quality materials, the range ensure high durability, tensile strength and resistivity to corrosion.